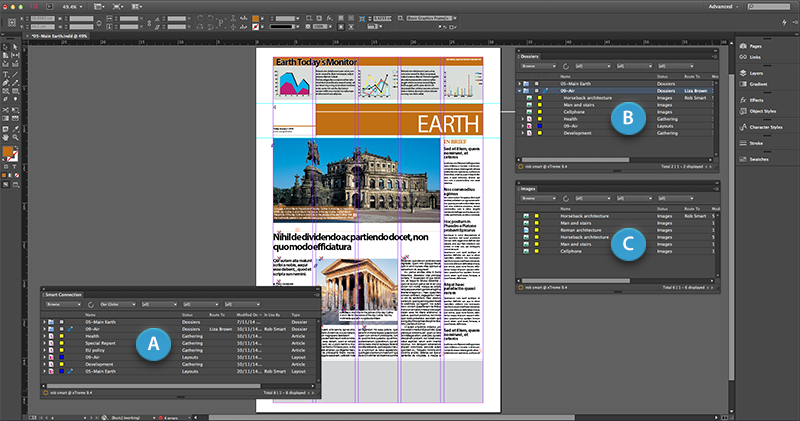 When using Smart Connection in InDesign or InCopy, the Smart Connection panel is your main link to the files that are stored in the Enterprise database and will therefore be the panel that you will use most often. Through this panel, you can search for files that are stored in the Enterprise system and subsequently manage them in many ways: open layouts or articles, places files on the layout, route files to other users, and much more. Figure: The Smart Connection panel. Choose View > Smart Connection > Smart Connection. Figure: The components of the Smart Connection panel: the Search pane (A), the Document pane (B), the Preview pane (C), the Status bar (D) and the panel menu (C). In Enterprise, all files are stored in a database. Locating a file is done by using the search options that are available in the Smart Connection panel. For detailed information, see Searching and locating files using Smart Connection. When a file is selected you can quickly select another file by typing the first letter of the name of that file. This will make the selection automatically jump to the first instance of the file of which the file name starts with the typed letter. Example: The Smart Connection panel shows a long list of files, each starting with a different letter. To quickly select the file starting with 's', select any file and type 's'. Opening files that are stored in Enterprise is done through the Smart Connection panel, in most cases simply by double-clicking them. Placing files that are stored in Enterprise onto a layout is done through the Smart Connection panel, in most cases simply by dragging them. 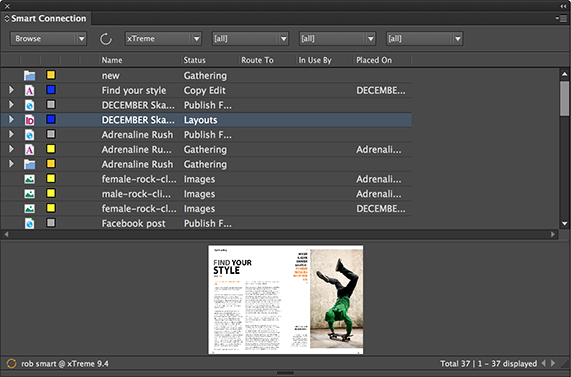 For detailed information see Placing files on a layout using Smart Connection for InDesign. Working on a publication is team work. While you work on a layout or article, other users are working on other files at the same time. When working with defined deadlines, you also need to know how much time you have left to finish you work. The file is checked-out by you. The file is checked-out by another user. The file has been taken offline by you. The file has been taken offline by another user. An update from the planning’s interface is available (for layouts only). Hover the mouse pointer over the icon to display the Flag’s status message. Gray. Object has no Deadline. Green. Object is well within Deadline. Yellow. Object is nearing Deadline. 1 Check with your Administrator which time periods have been set for each deadline and how long before the end of each deadline the icon color changes. Bold. Newly added files are placed at the top of the list and displayed in bold font style. Italic. Files for which the properties have changed are shown in italic. Grayed Out. Files that are grayed out are those that either don’t meet the search criteria anymore—for instance because one of their properties such as its State has changed—or files that have been deleted. Note: When the panel is refreshed, the entries will be displayed in normal style and sorted according to the column sorting order. Files that are moved to the Trash Can are removed from the Smart Connection panel. Figure: The different ways in which text is formatted: bold (top) for new files, italic (center) for changed files, and grayed-out (bottom) for files that have been moved to the Trash Can. You can control the way information is displayed in the panel in various ways. To sort a single column, click its header once. To sort multiple columns, click the header of the first column and Shift+click each subsequent column header. A black triangle is shown in the first column header; a hollow triangle is shown in all other column headers. To remove the sorting on multiple columns, click any column header. Figure: When choosing 'Show Preview' from the panel menu (top) the Preview pane appears in which a preview of a selected file is shown (bottom). If no preview is available (for instance when no thumbnails were saved with a layout or image), the application icon is shown. For text files, the first 250 characters are displayed. Tip: To change the size of the text displayed in the Preview pane, change the Preview pane font size setting in the Smart Connection preferences. By default, the Document pane shows all types of files: layouts, images, articles, Dossiers and so on. When you want to work on files of a particular file type though, you can hide all other files types by filtering the Smart Connection panel. This makes it easier to find the file that you are looking for. Figure: The Smart Connection panel filtered to show only Dossiers. You can change the font size of the text in the Documents pane and that of the Preview pane by changing the Smart Connection preferences. Figure: You can change the text size in the Document pane and in the Preview pane to your liking by changing the preferences. For more information, see Smart Connection preferences. When viewing the Smart Connection panel in List View mode, the properties of a file — such as its name, Workflow Status, the name of the use who has got the file checked-out and so on — are shown across multiple columns. 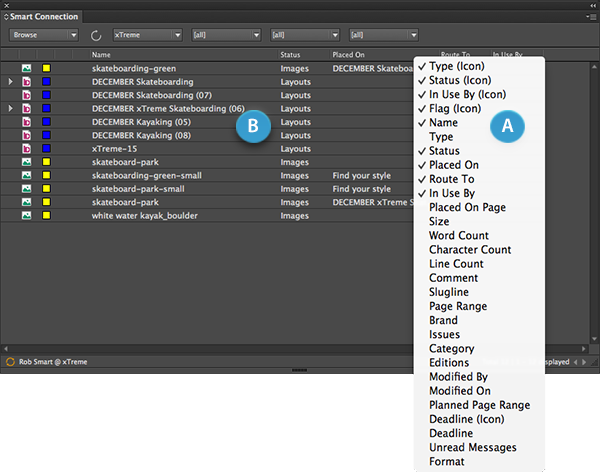 You can control which of these columns are shown by right-clicking a column and selecting a name. Columns that are currently visible have a check mark in front of their name, columns that are currently hidden do not have such a check mark. The order of the columns in the context menu is the order in which they are currently rearranged. After selecting a name, the column will be displayed if it was previously hidden and will be hidden if it was previously displayed. Creating additional Smart Connection panels is a great way of quickly accessing often used files that are stored in a particular location or files that are of a particular type. Example: You can set one panel up to access the files of one Brand and another to access the files of another Brand. Or, you can set up one panel to show Dossiers only and another to show images only. Figure: Creating multiple Smart Connection panels help you to quickly access often used files. Shown here are the default Smart Connection panel (A), one panel that is filtered to show Dossiers only (B) and another panel that shows images only (C). For more information see Working with additional Smart Connection panels in Smart Connection. Manually updating the panel is done by clicking the Refresh button. Note: This method is not available in Thumbnail view and in certain Search modes. Updating each time any type of action is performed on a file, including opening a file, saving a version, checking-in the file and so on. This method is known as the 'View update' method and is enabled on Enterprise Server. Updating each time a choice is made in Browse mode. When using the Smart Connection panel in Browse mode to search for files in Enterprise, the panel is only automatically refreshed when a choice is made from the Status list. It is also possible to refresh the panel each time a choice is made in any of the lists. This method is known as the 'Auto refresh' method and is enabled on Enterprise Server. Files can be placed more than once on a layout. To keep track of this, display the 'Placed On' column. 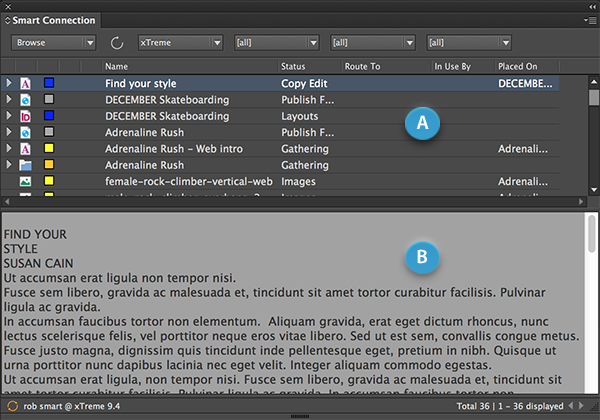 If a file is placed on one or more layouts, the name of each layout is displayed in this column. Note though that when a file is placed more than 50 times, only the text 'Multiple objects' is shown.